You might be thinking to yourself, lettuce in a smoothie? That was my initial reaction. 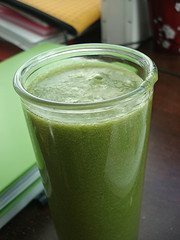 In reality, any green leafy vegetable can be blended into a smoothie. As is the case with most greens, lettuce is a good option for anyone looking to lose weight because of its super low calorie count. 1 cup of lettuce contains about 8 calories. Lettuce has a high water content, but does offer varying health benefits depending on the type. There are many different types of lettuce, each offering their own nutritional benefits. Romaine lettuce is especially high in vitamins A, K and C, and folate (folic acid). Romaine is also a good source of dietary fiber and minerals such as potassium and manganese. Iceberg lettuce on the other hand is a bit lower in nutritional content. Generally, the darker the green, the richer it is in nutrients. When choosing a type of lettuce for your smoothie (or salads), my advice is to go with the freshest option available. Even better, try a salad mix containing a variety of greens. I’m fortunate enough to get regular and spicy salad mixes from my local, organic CSA (Community Supported Agriculture), which is perfect for smoothies. For anyone in or around the Brighton, MI area, check out Stone Coop Farm for local, organically certified produce. Enjoy! Please leave a comment below if you try this recipe. Happy Blending! Hey Ryan this is Rons daughter Rachel. I can’t wait to try out some smoothies! Hi Rachel! I hope you thoroughly enjoy the smoothies you try. Let me know how they turn out, or if you have any questions. Cheers! Just made your smoothie and I gotta say it’s quite tasty. Thanks! I’m glad you liked this smoothie, Jessica, it’s one of my favs. Thanks for sharing. Unfortunately, I was not impressed by this smoothie recipe. I made it and could clearly taste the lettuce, which was not to my liking. However, that said, after adding a few things (jelly, more honey, peanut butter, more blueberries, orange juice–hey, whatever is in the fridge) it was pretty good. I think that the original recipe just need more umph, if you know what I mean. Thanks, though, for a nutritional and easy lunch today! I really appreciate the honesty. Not many people leave comments about my recipes not tasting very good. What I like even more is that you stuck with it and improvised to create a smoothie you enjoyed. I tried it today but since I didn’t have enough lettuce I added cucumber instead. Plus ground almonds for a little nutty taste and yeah, I liked it! Great recipe. Loose vs lose. My pants will be loose if I lose weight. Nice to hear you like the recipe. Thanks for pointing out my gaffe – it was just corrected. I love this smoothie, I replace water for coconut water and this was amazing! So delicious! Love taking it to dance practice to boost my energy, thank you! Dance practice energy booster, lovely! Surprised it was so tasty! Thank you. I just made the most delicious lettuce smoothie. Half a baby cos lettuce (organic), half an avocado, tablespoon of coconut oil; and water from two Thai drinking coconuts. Gorgeous. Yummy. Sounds delicious, Mary! Thanks for sharing. Hi Ryan, thanks for your recipe. I tried it and I really enjoyed drinking it. Actually I’m not so much after the taste. What’s important to me is the health benefits that go with it. I like the taste of healthy! More power to you and your smoothies. Or how many ounces are in it? All of my recipes are one serving size. However, server sizes vary depending on age, health, health goals, etc. Tweak the recipes to suit your needs. This was actually very good. I was able to use up my red leaf lettuce before it went bad and it was so tasty and filling. Thank you! Nice to hear that you enjoyed this smoothie, Mandy!